Once upon a time in Punjab, they would say “a man must have a Bullet motorcycle and double-barrel gun”. Arms have long been an intrinsic part of the state’s psyche — Punjab has seen enough weapons at the height of Khalistani terrorism. Considering the state has nearly 20 per cent of the total private licensed weapons in India and a much higher percentage of Punjabis with a misplaced sense of machismo, incidents of gun violence and sexual harassment (they both seem to go together in most cases) make headlines almost every week. On Friday night, Punjabi singer Parmish Verma, best known for his number "Gaal Nahi Kadni", and his friend Kulwant Singh Chahal, were shot at in Mohali. 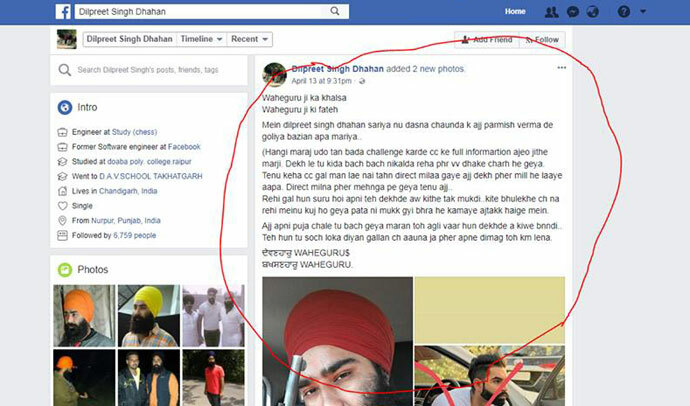 Gangster Dilpreet Singh Dahan, who had been accused of shooting a sarpanch in Chandigarh last year, boasted of his involvement in the murder on his Facebook wall. One picture showed him holding a revolver, while another had a cross marked over the deceased singer’s picture. A few months back, a 22-year-old MBA student was killed during celebratory firing at Hoshiarpur. Last year, a clash between two rival groups at the Panjab University campus in Chandigarh over catcalls during a fashion show landed two students in hospital. The past 15 years have witnessed a spurge in the number of gangs, indulging in murder, loot, extortion and carjacking operating in the state. Lawrence Bishnoi, a former leader of the Students Union of Panjab University (SOPU), and Sukha Kahlon gangs being the prominent ones. Punjab has witnessed a peculiar kind of gun culture in the post-militancy and post-liberalisation period, with abundant money coming in from land sale in the countryside and migration towards the capital Chandigarh, almost an aspirational city for many youth hailing from rural areas who, in their huge SUVs, mark their presence outside girls’ colleges. Of course, this is not to say that their economic status, coupled with the appeal of breaking the law (considered “cool” by some) can be discounted. Several songs have lyrics praising arms and shooting for the sake of Jatt pride. In a state plagued by the drug menace while insisting on a sense of false cultural superiority, those working for gangsters have had little or no education, and mostly from economically backward families. Shockingly, contemporary Punjabi songs and films have always glorified guns and drugs. Research conducted by the Indian Institute of Management (Ahmedabad) said that the majority of Punjabi songs had references to drugs. Several well-known singers – from Diljit Dosanj to Jazzy B to Honey Singh to Diljit Dhillon to Zora Randhawa — are known to praise arms and shooting, for the sake of Jatt pride (whatever that is supposed to mean) and revenge killings in their laughable videos that get millions of hits on YouTube. Most of the artists insist that it’s the record companies that ask them to work on such projects and the latter quote sales figures to justify the songs’ appeal. To “counter” songs that propagate violence, drugs and vulgarity, state culture minister Navjot Sidhu recently announced the setting up of the Punjab Sabhyacharak (Culture) Commission. The panel will be headed by the chief minister, with Sidhu as its vice-chairman and noted poet Surjit Patar as a select member. The commission will be empowered to recommend the registration of a police complaint if it finds the content of a particular song vulgar (after due warning). This, too, has come as a shocker. Who is to decide people’s taste in music? And how fair is it to blame songs for rising gun violence, crime against women and drugs? And well, what has the world come to if Sidhu is part of a cultural committee? Who isn’t aware of his sense of humour? Even before its constitution, the committee has come under fire, with intellectuals and academicians across the state expressing their concerns. Also, it is strange that the law and order machinery, instead of coming down heavily on gangsters, is busy asking Punjabi singers not to perform songs glorifying violence, drugs and sexual harassment, besides going all out on Twitter and Facebook to exhort the youth to not imitate actions shown on celluloid. Perhaps, the next logical step for the state government would be to get on board some psychiatrists and psychologists to evaluate the psyche of the youth who are impressionable and easily influenced by the provocative songs, and take the screen world seriously.